The petitioners recently completed their arguments in the OBC quota case. The government opened its arguments yesterday. It appears that the government is trying to argue that caste is the main (if not the only) requirement for a group to gain entry into the OBC list. This would be an effective way to deflect people who want data and not life stories to dictate public policy. “In matters of this kind, namely removal of backwardness, removal of untouchability and achieving a casteless society, there can be no time limits. No time limits can be fixed for the measures of social engineering,” he said. Lets leave untouchablity out of this. Why cant there be a time frame for removal of “backwardness” ? If there is program without a timeframe, then there is no way to calibrate it. Central to the governments’ arguments lie the intepretation that : like SCs the SeBCs are also purely caste based. There is no need for data, because even if you could show that every OBC owned a beach house and a Mercedes it would make no difference. (Sorry for the extreme example, but this is a theoretical possibility). In other words, data is deemed illogical !!! If caste is identified as being backward and individual survey for determination of Socially and Educationally Backward classes is out of question then nothing more can be done. 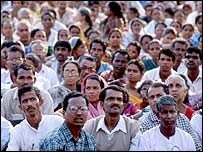 Caste should be considered as the determining factor of backwardness for the purposes of reservation, said centre. The question is: If caste alone determines membership into the OBC group, then states like TN who have classified 72% as OBC (NSSO 61st round) need to be explained. Are the remaining 4% (NSSO 61st round) so dominant politically, economically, and educationally (control of private education) – that they can drive so many into backwardness. Conversely, are Bengal, Assam, and J&K such a picture of harmony ? If caste alone determines OBC status, then what about Muslims and Christians ? The court recently asked whether a single caste has been expelled from the OBC list (remember TN is approaching 85+ years of caste based reservation). The question is : Is this level of public participation desirable or even possible in this issue ? How can anyone complain if there is no up-to-date public data available for each caste in the OBC list ? Is the public expected to conduct private field studies targeting the removal of a caste from the list ? No body would like to target a single caste. This policy, even if it worked exactly as designed will is a recipe for caste wars. Meanwhile, the Law and Other Things blog thinks the governments arguments are “robust”. 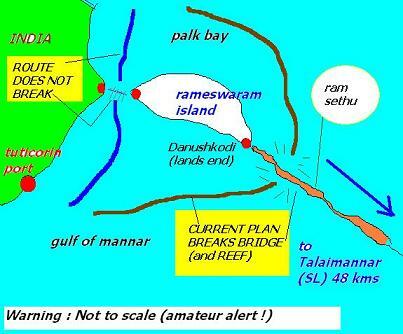 Ram Sethu – no study was ever done ! Will the real scientists please stand up ? See this related post by the real fake rational scientist. The ASI has confirmed the following today to the media. Fable or fact, even the Archaeological Survey of India doesn’t really know. Sources within the ASI have confirmed to CNN-IBN that the ASI never conducted any study or investigation on the Ram Setu. Which means the controversial September 12th affidavit to the Supreme Court saying there was no historical proof of the Setu being man-made was submitted without conducting a study. While the ASI bore the brunt of challenging faith and two of its officials awarded suspensions orders, sources in the ASI confirm that they would have conducted a study on the Ram Setu if they had been commissioned to do so. Should’nt the ASI have made use of this opportunity to declare that it had no scientific data to take a position on the issue, instead of grandstanding ? To conclude. What is a real fake rational scientist to make out of this affidavit ? Even after removing the outrageous paragraphs, the affidavit will have no scientific or rational legs to stand on. You cannot use science to prove anything in the religious domain. Yes, not even the absurdity or Narasimha Avatar or Sanjeevani mountain. Sorry for bringing this reality check to your doorstep. Try attacking magic and voodoo, you have a better chance there. If you want to take a crack at god, try taking on Kurt Godel first. It might even win you a prize. A truly rational scientist asks the following questions to the ASI. You may be aware that recently there has been a lot of anxiety about your affidavit stating that there is no scientific evidence that the Ram Sethu could have had a non-natural past. Your comments about the characters and events in the epic caused a lot of heartburn to the public. On behalf of all people who want science to take its rightful place, I hope you can throw some light on the following questions. 1. What expeditions have you undertaken in the Palk Strait area ? Can we have a list made available on your website ? Were they underwater or just arial surveys ? 2. What methodology have you used to locate submerged artifacts ? Any sonar / radio equipment ? Can you list them ? 3. How many rock and coral samples have you collected ? Have you taken expeditions in Sri Lankan waters ? Have you excavated at Mannar island and its surroundings ? I cant find any mention of excavations on your website in the Danushkodi area, in and around Pamban, or underwater in and around the Ram Sethu in Indian territorial waters. I cant find any mention of underwater archeology in the Palk Strait / Mannar Bay in Indian or Sri Lankan waters on your underwater archeology website. I also cannot find details of co-operation with the Sri Lankan side at and off Talaimannar. 4. A Congress MP claims that the ASI used to guide tourists at sites like Chitrakoot and Bharadwaj ashram. ASI information boards pointing to various sites associated with characters in the Ramayana were placed at these sites. Is this true ? I request you to make available these material on your website, preferably in PDF format. PS: I would humbly request you to get a real email address instead of using a free GMAIL account. This is simply because all your emails including sensitive ones will be stored on overseas computers. The ASI is an important part of the Indian government, we cant afford to take a risk with the critical communications stored and controlled by other countries. Update : Government’s position is also along expected lines. That the OBC count is certainly greater than 27% and that no one has approached the NCBC for removal of castes from the list. The central question remains unanswered : For each caste in the OBC list, is there data available about its current condition ? The “magic wand” of Indian political forces is being challenged in the Supreme Court. The petitioners have completed their arguments today. Centre will present its side starting from Sep 25th. I am kind of disappointed that petitioners did not seem to press the point of “presence of abilities“. How to treat a caste which is able to secure adequate not necessarily proportional seats in the open competition ? The rest of the arguments drives home the lack of current data to identify the socially and educationally backward. This is pretty much what this blog has been saying all along. The presence of and recentness of data is crucial because we are trying to identify groups that ARE socially and educationally backward, not those who WERE socially and educationally backward. The government’s case will be interesting. I wonder if they will try to use Ekalavya and Sambukha and Manusmriti to buttress their ten-thousand year old oppression case. We need all the scientists and sociologists at hand here to give their inputs in the real world. Events and characters in Treta Yuga can wait. These past few days have made me really happy. Indians are rising up asking for science and economics to take its rightful place. “Where are the scientists when we need them most ?” wonder many. How can we let the country be hijacked by monkey stories in the 21st century ? There are two universes, each with its own laws. Who lives here ? The faithful and those who just want to piss off the atheists. Laws : The system is completely based on life stories. Example : Karthi had money problems, went to Tirunallar and he became wealthy. Lakshmi prayed to Tirupati and passed her exams. Robert had a disease and a pastor touched him and he was cured. History : Belief is history and history is belief. Depending on the flavour of the universe, history goes back in time. In the Treta yuga (when the Ramayan) happened, people lived for 10,000 years. So, you would have guys who are 6820 years old, and that would be normal. In other flavours, people could part the seas and turn water into wine. Role of science : None. Science doesnt work here. Any scientific argument can be defeated with ease. This happens by just upping the ante until you link it up to a known scientific conundrum. Ram Sethu was man made -> No, it was formed by waves and coral deposits -> Ok fine, then Ram Sethu was made by God -> How did God make it ? -> He summoned the waves and the coral deposits. -> What about the vanara sena, then ? -> They are just metaphors representing divine forces -> What divine forces ? -> The sum of all scientific unknowns -> End of discussion. Science cannot win ! This is what I call a religious wall in my previous post. Why are you asking scientists not to explore the absurdity of the Narasimha avatar or Hanuman ? It would be a waste of the scientists PhD if they worked on research papers to address issues like the following. It does not take a 5th standard kid to see the absurdity in this if he did not live in this “universe”. On the other hand, even Nobel Prize winning scientists who live in this “universe” will take up highly nuanced positions rationalizing this type of impossibility.It would result in a paper like this great lampoon. Who lives here : Everyone including all those who live in Universe 1. Laws : The system here is based on science. The behaviour of populations are influenced by game theory. Life stories are not acceptable here. We need each and every action to be based on scientific, economic, or social indicators and data. History : Written mostly by winners of any given age. Needs evidence that can satisfy the measurement tools we have at our disposal today. Role of life stories : Life stories have absolutely no role to play here. Everything must be touch and feel. This means Ekalavya stories and Manusmriti must not be considered to be evidence of the actual occurance of the events, established laws, or the characters. These characters belong in Universe 1 (life stories) and have no role here. We need data to validate every claim. Policies based on 5,000 or 10,000 year old events – must be pulled up by scientists. Role of data and detailed examination : Critical. Simply because living in Universe 2 (the real world) is not optional. Words cannot substitute numbers. Poverty is real. Oppression is real. Words are not real, numbers are real. We need scientists, sociologists, and economists in Universe 2. Do not waste your valuable time in Universe 1. Lets leave it to the atheist clubs. This is where we loose our bearings. We run around like headless turkeys. Scientists forget they work in Universe 2 and make a fool of themselves by attempting to investigate events and characters in Universe 1. In the Ram Sethu issue, scientists, geologists, and environmentalists must not attempt to address any issues in Universe 1. Instead, engage in an informed debate about the economics, environment, oceanography, and geology of the issue. Even then it may turn out to be a futile exercise because it may be that Faith trumps everything at this point in Indias history. Just do your job professionally and forget about the results (whether or not the Sethu is blasted). Incidentally, this approach is one of the beliefs of Universe 1 too (See the secret of work in the Gita – one of my personal favorites). This is when the government (the ruler of the real world) must make a call. It is fully possible to steamroller the Ram Sethu ( a central artifact of Universe 1). Taking it a step further, it is even possible to outlaw Universe 1 altogether. China banned all religions until recently. If may also be possible to outlaw certain flavours of Universe 1. (Saudi bans all flavours except one). All these options are open. It is all a question of balancing the two Universes. You are completely free to hit at Universe 1, but you are not free to avoid a backlash. If you think you can survive the backlash, there is little sense in not hitting. It is for the powers to decide whether they can withstand a backlash against an attack on Universe 1 now, or whether they should wait until conditions are more in its favour at some future point in time. This kind of brazenness in an affidavit is completely unbecoming of the government. Nobody asked the ASI to comment on the existence of Ram – they should have restricted themselves to stating whether the Ram Sethu has archeological significance to their organization. Step back and ask yourself : What is the issue before us ? The hindus believe that Rama is God and that the bridge was built by his sena. Well, the arguments must end there. You just ran into a religious wall. Christians too believe that Jesus could cure lepers by just touching them. We certainly dont want the Archeological Survey of India to question this on medical grounds ! How do we know that Hazratbal Mosque has the prophets hair ? Can the UPA government ask for a DNA test ? Guha’s latest article gets the Barbarindian treatment. Nothing confounds Indians more than the exact nature of our Independence movement. Did Gandhi’s non-violent methods actually wrest independence from an unwilling colonial power ? Were Gandhi’s non-violent methods used as a tool to accelerate and negotiate the modalities of a withdrawal which was anyway impending ? Ramachandra Guha blends a cocktail which attempts to make short work of the very concept of warfare. It is interesting, this phenomenon, this adoration of violent revolutionaries by men who owe their political independence and their democratic freedoms to a bunch of (now mostly dishonoured) non-violent reformers. I think the last paragraph is the point he is trying to drive at. He is trying to cleverly use words like “violent revolutionaries” instead of “revolutionaries who favour violent methods” to pin down a character trait to these leaders. 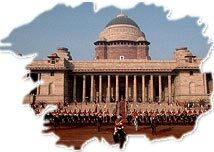 The unpleasant fact is that todays’ Indians owe our political independence not just to Gandhi but also to the British in equal parts. I was furious when I was told this by an English colleague, today I know this is the dominant view of the outside world. Mr Guha, this is the nature of the human species. This is why Americans still get the chills when their “violent” national anthem is played. This is why we have the Bhagavad Gita, the ultimate answer to your troubles regarding the use of violence. This is why every village in the south has ayyanar temples to local heroes of a bygone era who fought and lost and not to people who negotiated a settlement. Is anyone interested in purchasing real estate at low prices ? We have red-soil and other lands available starting from the unbelievably low price of only Rs 2,800 per ground (2400 sq ft or a 60×40 site). This translates to about Re 1.20 per square foot. No, that is not a typo. You get a ground of land for only Rs 2,800 (the cost of filling up diesel in your van). Also bulk quantities available at Rs 30,000 to Rs 80,000 per acre (18 grounds). For lands with water facility the costs goes up to Rs 90,000 per acre (still a great deal). This is not a scam. All legal documents are taken care of and approved by the government. After the sale, your titles will be clean and guaranteed. The lands are situated around Tuticorin (port on the Bay of Bengal) at Sattankulam, Naduvakurichi, Kulasekarapattinam (famous temple town) and other villages. Lands are also available for dirt cheap rates near the temple town of Tiruchendur. Hurry up while these prices last ! The lands are getting sold fast !! A recent post on The Acorn criticizes the newly formed UPA-Left committee to discuss the nuclear deal with the USA. I agree with most of the article, but I am not sure if there is a valid ground to challenge the composition of this committee. Two of its members are not elected representatives (Karat and Bardhan). Even if a PIL were to be favorably ruled upon, it would result in a bigger farce. Two elected stooges would just replace Karat and Bardhan and relay the information via cell-phone-speakers (every MP has one these days). 2. Refusal to convence a Joint Parliamentary Committee to take into confidence all sides. I will concede that a Reality Check on the exact state of our nuclear capabilities is not worth making public via the Parliament. I cannot however understand why the BJP’s request for a JPC has to be rejected outright. The Congress Party led UPA did not have any problem with constituting a JPC for the OBC quota issue. Government rejected NDA’s demand for constitution of a Joint Parliamentary Committee to go into the Indo-US nuclear deal issue on Wednesday, according to Opposition leader L K Advani. A 15-member UPA-Left committee to go into the concerns raised by the government’s outside allies on the Indo-US civil nuclear deal was announced on Tuesday by External Affairs Minister Pranab Mukherjee, who will be its convener. The committee will have six members each from Congress and Left parties and one each from UPA constituents RJD, DMK and the NCP. This clearly shows that the Left and the Congress are staging a drama on a grand scale. Their goal is to prevent a reasonable debate on the merits of the Indo-US nuke deal along the lines offered by Yashwant Sinha (BJP).